Sorry for the lack of update. 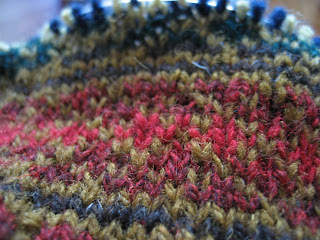 Twelve-hour workdays and a 2-day fever don't bode well for knitting and blogging. My knitting is almost exactly where it was a week ago. The Tilted Duster still has about 5 more collar rows, and some seaming to go. My first Autumn Rose sleeve is also still in the works. Despite all that, I thought I'd give you a bit of an update with promises of more to come in the next week. After boldly jumping head first into Autumn Rose, I got scared. Terrified in fact. My self-doubt took hold and I cast the project aside for a week or two to develop some level of confidence. 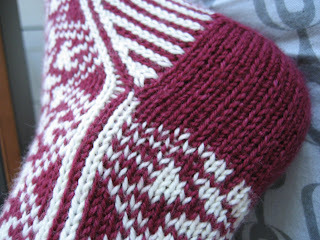 I decided to tackle one last stranded warm-up before taking the metaphorical fair-isle plunge. 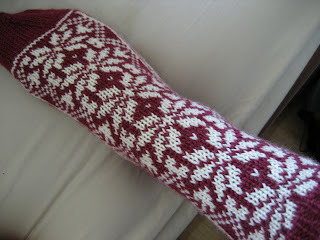 Enter Chrissy Gardiner's Snowflake Socks, also from the new Interweave (I love this issue). I love how this project is turning out so far. Everything is looking pretty John Dandy. The floats are nice and loose, the yarn was a stash orphan, and the ultimate gratification, they stretch enough to fit over my heel. So on that optimistic note, I decided to pick up Autumn Rose again. So far I've made it through the first part of the first sleeve. Still a long way to go but it is beautiful and I can't wait to finish the first motif repeat. My technique is a far cry from being perfect or even being technically correct, but I can live with it for now and I'm already seeing improvements. Considering the time it has taken to get this far, I expect that this project is one of those long-term type things. The body is going to require some serious project monogamy. Posted by Amanda at 5:26 p.m. It looks great! Very nicely done on the legwarmer, and the start of Autumn Rose is pretty too. September 24, 2007 at 1:40 p.m.
the colours for the Snowflake Socks are great. October 1, 2007 at 10:52 a.m.